Join the discussion on our forums! Come discuss Embrace Darkness over in our dedicated Embrace Darkness discussion topic. Might be good if priest had some sort of freeze effect. If elemental priest ever becomes a competitive deck then perhaps this could see some play. In the Reveal Stream, Kibler steals the opponents Lich King. Yes, of course, he trades and tried to suicide him, but he was only able to bring him down to 4 HP. In the End, he killed the Lich King of his Opponent and gets his own 8/4 Lich King for f*cking 6 Mana. Some people call it the 6-mana Mind Control. For Blizzard it's Embrace Darkness. For me it's going to be the Might Control, as you have no idea what's going to happen to the card before you get control of it. If you get control of it. If you're not dead because you just spent 6 mana to do nothing until the next turn. If it was the only minion, then best case scenario, your Might Control on their 6-drop will help you deal with their 7-drop. If it wasn't, you're probably dead. If it works like Mind Control, yes. I do hope they thought about that and added the same hidden charge effect Potion of Madness and Shadow Madness have. If it's not the case, then it's just absolutely unplayable. That statement is true for 99% of cards. They changed to wording on it; yesterday was "gain control", now it's "take control". This card is great when you're already ahead, but awful when you're falling behind--kind of like Shadowform. This card would need a lot of board support (like Radiant Elemental) and a taunt to be effective if board is contested. What scares me the most is if you cast it and someone silences your target, so that you just wasted 6 mana and didn't steal a big target from your opponent's board. Cool but actually slower than Entomb. 6 mana is really high mana cost. And you're getting the minion after your opponent turn. That means you will get it's damage one turn. That means you can play this card only on safe turns. If we were comparing cards to cars, I think this card has an overall higher average speed than Entomb, but worse acceleration. In many games, Entomb acts as a high-cost Shadow Word: Death you can target any minion with, because you may not see the card you stole before the game is decided. 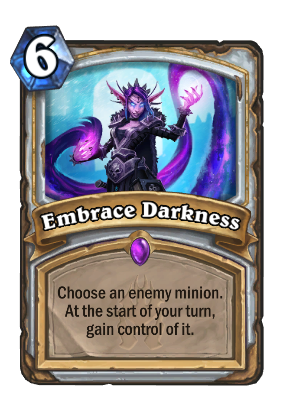 Embrace Darkness assures that the card you steal comes to your side the turn after it's played. I think the timing of playing this card is critical, and it's overall less reliable than entomb, but also puts more immediate pressure on your opponent, because they feel like the 7-mana minion they just played is a ticking time-bomb. It is slower, it takes literally a whole turn to activate. There is no way you could ever call this faster than Entomb.This gives your opponent priority as to how they handle the situation. They can choose to silence the creature, run it into anything you have up, kill it themselves, or bounce it back to their hand if that's a possibility. This doesn't ensure anything and has a higher opportunity cost (waiting a whole turn) than Entomb or Mind Control (an actual faster effect than Entomb). This card is good when your opponent played a bomb card on an empty board while you're well out of lethal and even then it can just about be OK, because you're gonna eat the damage and based on the wording you may not even be able to attack with it when you get it (getting it at the start of your turn). Basically this card is generally going to be bad. It's way too slow and gives your opponent priority. why, Entomb was 6 mana and it was a really strong card. soo you lose the card battlecry, and the fact that it will be on your opponent side for one more turn. but it will be on the board on your side the next turn(witch is strong). there are pros and cons but if Entomb sew play i dont see a reason why this will not. The exact thing was said about Entomb and it turned out a great card. Of course, not everyone waited to see in-game to judge. I would agree with you there, but the problem with this is that you have to wait a turn so your opponent could make an unfavourable trade so the minion you gain is much worse then what you'd pay for. However on the contrary it does force them to make and unfavourable trade. My guess is this is great in control vs control(Maybe some midrange) but bad in most if not all other matchups. Other than Entomb a card that's similer is corruption and that doesn't see any play.